The Mausoleum of Ruhollah Khomeini (Persian: آرامگاه روح الله خمینی), also referred to as the holy shirne (حرم مطهر), houses the tombs of the Ayatollah Ruhollah Khomeini, his wife Khadijeh Saqafi, and his second son Ahmad Khomeini; and some political figures, such as former President Akbar Hashemi Rafsanjani, former Vice President Hassan Habibi, Lieutenant General Ali Sayad Shirazi, Iranian Revolution figure Sadeq Tabatabaei, and MP Marzieh Hadidchi. The mausoleum is located to the south of Tehran in the Behesht-e Zahra (Paradise of Zahra) cemetery. Construction commenced in 1989 following Khomeini's death on June 3 of that year. It is still under construction, but when completed will be the centerpiece in a complex spread over 20 square kilometres (4,900 acres), housing a cultural and tourist center, a university for Islamic studies, a seminary, a shopping mall, and a 20,000-car parking lot. The Iranian government has reportedly devoted 2 billion US dollars to this development. 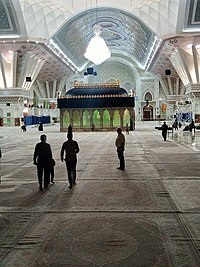 The site is a place of pilgrimage for followers of Khomeini. It is used symbolically by government figures, and is on occasion visited by foreign dignitaries. Every year, Khomeini's death anniversary is marked on 4 June at the mausoleum in a ceremony that is attended by governmental officials, foreign ambassadors, and others. Khomeini's grandson Ayatollah Seyyed Hassan Khomeini is in charge of caring for the mausoleum. The Haram-e Motahhar Metro Station is the closest metro station to the mausoleum. The architect of the tomb was Mohammed Tehrani. The exterior of the shrine complex is a highly recognizable landmark. It has a gold dome sitting on a high drum, surrounded by four free-standing minarets. The shrine is surrounded by a large rectangular plaza which has been designed to hold vast numbers of visitors. With its size, inclusion of a qibla wall and a maqsura, the tomb resembles a mosque, but has been called an Hussainia. Inside, Khomeini's sarcophagus is centrally placed under the gilded dome. The dome sits above a transition zone with two layers of clerestories, decorated with stained glass depicting tulips (an Iranian symbol of martyrdom). The dome is supported by eight large marble columns that circle the sarcophagus, that together with other smaller columns support the space frame ceiling. The ceiling is also punctuated by clerestories. The floor and wall surfaces are made of polished white marble. The floor is covered with fine carpets. Non-Muslims are allowed inside the complex. On June 20, 2009, a suicide bomb attack occurred near the site of the Mausoleum, according to Iranian state-controlled media. The attack did not damage the mausoleum. On June 7, 2017, the mausoleum was attacked by three gunmen  while a suicide bomber detonated a bomb at the mausoleum. One female militant attacker was captured. Government officials later claimed to have thwarted a third attack. One person died and five people were injured. Others attacked the parliament building at same time. Wikimedia Commons has media related to Mausoleum of Ruhollah Khomeini. ^ "7 killed in twin attacks on Iranian parliament and Khomeini's tomb, Hostage situation underway". Muslim Global. Retrieved 7 June 2017. ^ a b "Iran attacks: 'IS' hits Parliament and Khomeini mausoleum". BBC. 7 June 2017. Retrieved 7 June 2017. ^ "Invasion four terrorist to Khomeini Shrine/ One woman was captured". fa.alalam.ir (in Persian). Retrieved 7 June 2017.